Firmware is the operational software that is embedded in your Cyber-shot® camera. This utility updates the firmware of the DSC-R1 Cyber-shot digital still camera to version 2. NOTE: The serial number is located on the bottom of the camera. WARNING!! : This utility is only for use with the Sony® DSC-R1 Cyber-shot® digital still camera. Do not install this utility with any other model of Cyber-shot camera. This update cannot be performed with the camera powered by battery. Be sure to use the supplied AC-L15 AC adaptor to insure constant power. WARNING!! : Update functionality is not guaranteed if you use another commercially available USB cable. 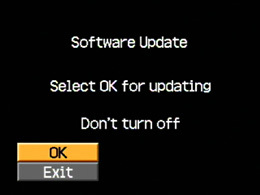 Performing the firmware update will return settings other than [Video Out] and [Language] to the default settings. Click here to see a list of the settings that will be to returned the default settings. To restore your personal settings, you will need to set them again. Click the Download link at the top or bottom of this page to view the "Software Agreement". Read the agreement, then, if you agree, click "ACCEPT AGREEMENT" button to download the firmware update file. Download the DSCR1V2.EXE (1.45 MB) (for Windows OS) or the DSCR1V2.ASH.SIT (1.52 MB) (for Mac OS® 9.1 / 9.2 / X v10.3) or DSCR1V2.ASH.ZIP (1.40 MB) (for Mac OS® X v10.4) file to a temporary or download directory (please note this directory for reference). Go to the directory where the file was downloaded and double-click the downloaded file to begin the extraction. One file named DSCR1V2.ASH (3.00 MB) will be extracted. NOTE: Depending on your operating system, the file may be automatically extracted while downloading. Prepare the recording media (Memory Stick / CF card / Microdrive) to use for the update, then format it with the camera. Copy the firmware update file (DSCR1V2.ASH) to the recording media with one of the procedures below depending on your computer environment. Insert recording media that has been formatted with the camera in the memory card slot of your computer. Copy the update file (DSCR1V2.ASH) to the recording media. 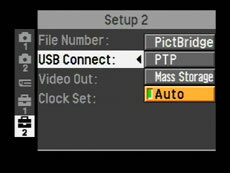 Insert recording media that has been formatted with the camera in the memory card reader. NOTE: Sony cannot assure the performance of third party media cards and card readers used in this update process. If in doubt, please refer to the in-camera process below. Insert recording media that has been formatted with the camera in the appropriate slot of your camera. 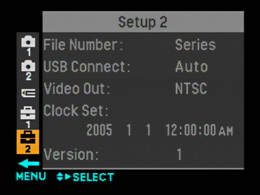 Set the /CF switch to if you are using Memory Stick media, or to CF if you are using a CF card or Microdrive. Connect the AC adaptor to the camera. Move the multi-selector rightward to [Setup], and then move it further rightward as needed to display the setup screen (as shown at right). 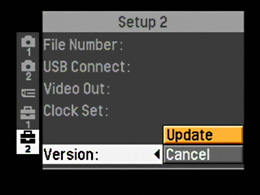 In the "Setup" screen, move the multi-selector downward to select [Setup 2]. 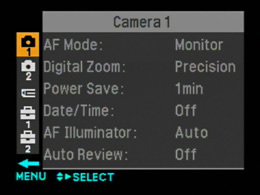 Copy the update file (DSCR1V2.ASH) to the recording media inserted in the camera. Insert the recording media (Memory Stick / CF card / Microdrive) containing the update file (DSCR1V2.ASH) into the camera, if it is not already inserted. Connect the AC adaptor to the camera and to an AC power source. NOTE: This update cannot be performed with the camera powered by battery. Be sure to use the supplied AC-L15 AC adaptor to insure constant power. Press and hold the "MENU" button, and while holding, power on the camera, releasing the "MENU" button only after 2 seconds have passed. NOTE: When the "Cyber-shot" screen disappears, release the MENU button. Use the multi-selector to select [Version], and then select [Update]. Cause: There are multiple files or folders on the CF card or Microdrive because it was not formatted before the firmware update file was transferred. Solution: Format the CF card or Microdrive in the camera, and then redo the entire Software Updating Instructions procedure. When the update is successfully finished, the "Finished" screen appears. Power off the camera. With the camera power turned off, use a pointed object to press the "RESET" button. NOTE: When you press the RESET button, settings other than [Video Out] and [Language] will return to the default settings. To restore your personal settings, please set them again. Click here to see a list of the settings that will be to returned the default settings. To restore your personal settings, please set them again. Turn on the power while pressing and holding the "MENU" button for longer than 2 seconds. Move the multi-selector rightward to [Setup], and then move it further rightward. If the version has successfully been updated, format the recording media (Memory Stick / CF card / Microdrive). 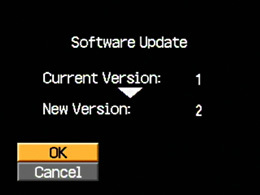 By updating the firmware, the following settings will return to the default settings. To restore your personal settings, please set them again.